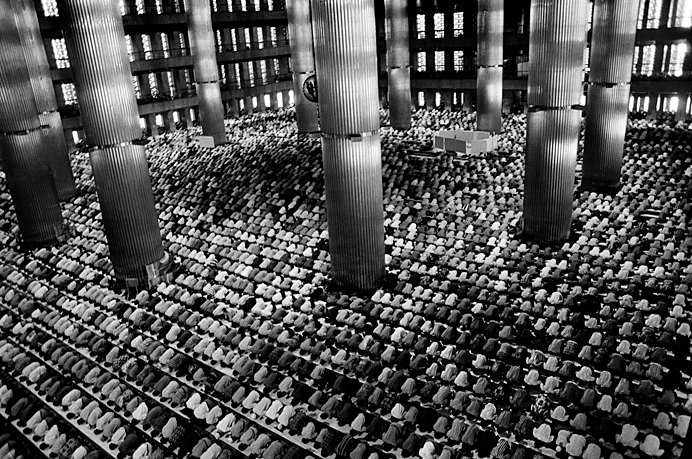 Built in the 1960's by Indonesian President Sukarno, up to 10,000 worshippers can pray at Jakarta's Istiqlal Mosque. Photojournalism is a precarious, often frustrating and occasionally wonderful way of life. Photojournalists are not protected from the reality of what is happening in front of them. Nor are they immune to the effects of human emotion. 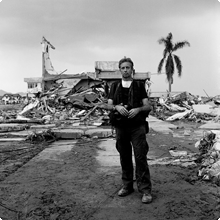 Whatever the motivation to pursue this type of work—whether it is a sense of tradition, professional principles or out of humanitarian concerns—in the hands of these dedicated professionals the camera has become a significant storytelling tool. Whether they are completing a personal project in some remote part of the world or working alongside their colleagues in the latest hotspot, photojournalists will continue to offer us a true glimpse into the human condition. As freelance photojournalists, a lot of what we do is in isolation. However, occasionally you find yourself working on a story in competition with other members of the media. It is during these times that bonds are formed. Colleagues become life-long friends and you find yourself a member of a unique global community. You catch up in exotic watering holes and swap stories. You laugh, trade insults and argue about everything from ethics to the quality of the best local beer. In the field, you watch each other's backs. You develop respect for the integrity of your colleagues and draw inspiration from their work. 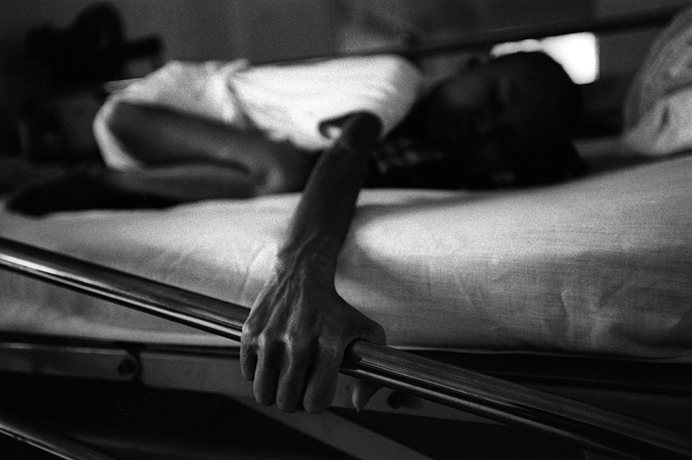 Whether it is capturing issue-related stories such as HIV/AIDS, Third World conflict or daily life, photojournalists are expected to record what they see in a fair, truthful and informative way. They offer us stories of struggle and hope and document the aspirations and traditions of people around the world. Some photographers push visual boundaries with complex compositions that can tell you as much about the photographer as the subject, using their mind's eye to record reality as art. Others seem less interested in making a "good photograph" than they are about gathering evidence: creating images that will influence public opinion and go on to have historical significance. Up until the age of 25, I was a professional guitarist. 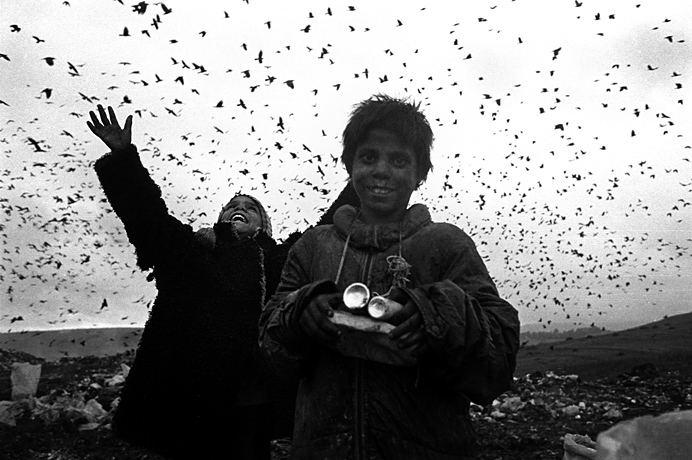 During that time I had developed an interest in documentary photography—photojournalism in particular. I began to grow restless with music, so I made the decision to switch careers. Memories of leafing through a copy of Life magazine in a doctor's office at a young age, and coming across the shocking images of the My Lai massacre in Vietnam had a profound effect on me. I am positive that this influenced me when deciding what kind of photography I wanted to pursue. Since then, I have had the good fortune to work extensively in the Middle East, Europe, Australia and Asia, most notably reporting on East Timor's struggle to gain independence and Indonesia's first steps towards democracy. Photojournalism has never been the easiest way to earn a living, so I occasionally work in the Australian film industry as a production stills photographer to supplement my income and help finance my personal projects. Traditional media is evolving, and despite the fact that there are less assignments and guarantees from publications these days, I am optimistic that this ever-changing "new media" will mean more opportunities and control over how we present our work. We have to find new ways to deliver our stories and fulfill our responsibilities to the people whose stories we are trying to tell while still earning a living. Social networking has changed the way we communicate with each other, and I can imagine a time when a large number of discerning online viewers will be willing to pay to view a more dynamic digital equivalent of what would have been a traditional ten-page spread in TIME magazine or Newsweek. This digital revolution has realized a better way of creating and delivering our images. To survive, we have to evolve alongside it, understand how it works and make the most of its benefits. Photojournalism is as much a way of life as it is a career, and it is a privilege to be able to witness and record historic events while revealing something of the world to others. It is a great honor to be chosen as one of seven Nikon Ambassadors in Australia. It is a great program, and the other Nikon Ambassadors have been an inspiration. I have been very fortunate to have a wonderful long-standing relationship with Nikon, having relied on their equipment from day one. Their support and service has been second to none. I took part in the launch of the D3 and D300S when they were first released, and have recently played a part in the recent releases of the Nikon V1 and J1 mirror-less cameras. Nikon showed us exceptional hospitality, and the ambassadors that could attend the Nikon 1 launch had a great time. We are occasionally invited to talk at professional photography events, most recently at the PMA trade show in Sydney — I look forward to more opportunities to discuss my work and my relationship with Nikon and its products. I have a carefully selected collection of Nikon bodies and lenses. From the impressive AF-S NIKKOR 14-24mm f/2.8G ED to the AF-S NIKKOR 70-200mm f/2.8G ED VR II, I have whatever I need for my assignments. My number-one camera is the Nikon D3S, but for personal projects, I usually carry two bodies: a D3S, and a D7000 for video. The lenses I use most are the AF-S NIKKOR 24-70mm f/2.8G ED and two primes: AF-S NIKKOR 35mm f/1.4G and AF-S NIKKOR 85mm f/1.4G. With this combination, I can pretty much photograph anything that interests me at any time of the day or night. I believe less can be more, so for the most part I find it best to keep it simple. I am perfectly happy to wander around with only one body and my AF-S NIKKOR 35mm f/1.4G. 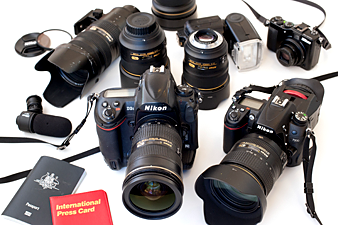 Cameras: Nikon D3S, D700, D300S, D7000 and various (retired) film cameras such as F2AS, FM2 and several F100's. NIKKOR lenses: AF-S NIKKOR 14-24mm f/2.8G ED, AF-S NIKKOR 24-70mm f/2.8G ED, AF-S NIKKOR 70-200mm f/2.8G ED VR II, AF-S NIKKOR 24-120mm f/4G ED VR, AF Nikkor 20mm f/2.8D, AF-S NIKKOR 24mm f/1.4G ED, AF-S NIKKOR 35mm f/1.4G, AF-S NIKKOR 50mm f/1.4G and AF-S NIKKOR 85mm f/1.4G. 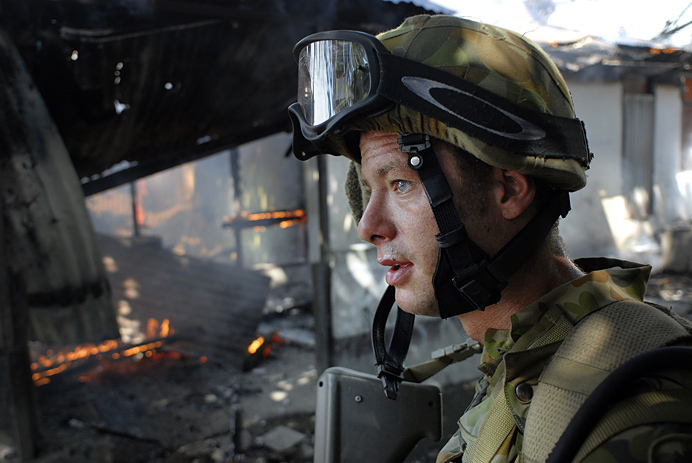 A Walkley Award-winning photojournalist, David Dare Parker has photographed for many national and international magazines throughout Asia, the Middle East, Europe and Australasia. Publications include LeMonde, Stern, L'Express, Focus, Australian Geographic, The Bulletin, The New York Times, Fortune and Time Australia. He is featured in the Australian War Memorial book Contact: Photographs and the modern experience of war and War: A Degree South Collection. He occasionally works in the Australian film industry as a production stills photographer. Recent credits include Cloudstreet and Underbelly Razor. In January 2002 he was asked to coordinate a safety awareness course for Afghan Journalists in Peshawar, Pakistan for the International Federation of Journalists. 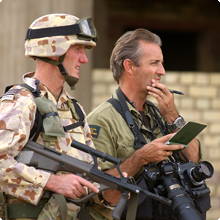 During April and May of 2003 he was the official war photographer for the Australian War Memorial during Operation Falconer in the Middle East—the first time an official photographer had been assigned by the AWM since the Korean War. 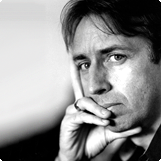 He was one of the original co-founders of Reportage, was a Director of FotoFreo Photographic Festival and a Walkley Advisory Board Member. 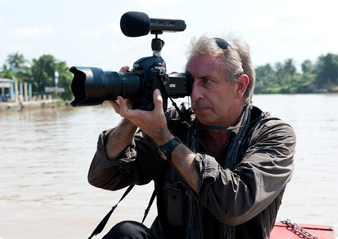 He is represented by °SOUTH in Australia and OnAsia Images in Asia and is also an Ambassador for Nikon Australia.